2 To make frosting, place pudding in a small dish. Add chocolate frosting and stir until mixed thoroughly. Refrigerate until cupcakes are ready to be frosted. 3 Place protein powder, sweetener, chocolate chips, 1 cup water, raspberries, and egg whites into a blender. Blend until pureed. 4 In a large mixing bowl, combine cake mix, baking powder, and salt. Add pureed protein mixture to the bowl and stir until completely blended. 5 Line a 12-cup muffin pan with liners or nonstick spray. Evenly distribute cake mixture among the cups. 6 Bake in the oven for 15 to 20 minutes. 7 Allow cupcakes to cool completely, and then evenly distribute frosting among the tops of cupcakes. 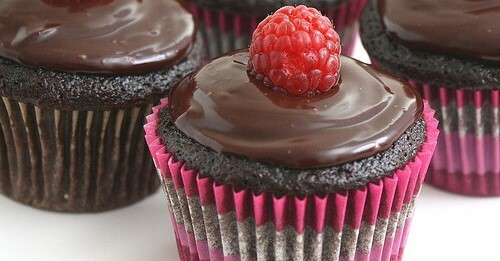 Top each cupcake with 1 of the remaining 12 raspberries. Refrigerate until ready to serve.